Alex and Olivia McArthur from Waverly Pastoral operate a dairy farm in Maffra. They milk 800-850 cows in total, across two dairies. Alex already had experience with installing and operating pivots. Waverly pastoral purchased ‘Dingwalls’ dairy across the road in 2013 on 95 ha. It’s currently milking 350 cows and predominately irrigated by a pivot that was installed in 2013, as well as flood irrigation. Previously the farms irrigation system comprised 31 ha of wild flood, and 5 ha of bike shift laterals. The flood irrigation system was old style, with low flow rates of 6 ML, many small bays, and no uniform paddock sizes. The flood system was very labour intensive, with outlets constantly needing changing, day and night. The intensity of the irrigation was uneconomical to continue, as staff costs would soon overrun the benefits of the irrigation for the business. Some higher areas of the paddocks were unirrigated, and some low areas suffered extensive waterlogging periods because of poor grading and drainage. Runoff from the flood irrigation system was lost down the laneway, resulting in no water or nutrient capture for the farm. Alex McArthur made the decision to upgrade the irrigation system from flood to spray when he bought the farm in 2013, knowing that the irrigation system was both too inefficient and too labour intensive. Alex completed an irrigation farm plan with full costs of the project calculated. From the plan, Alex made the decision to install a poly lined 6 span centre pivot covering 36 ha, with a swing arm to incorporate more area. The pivot is supplied by a farm storage that captures all the run-off from the Dingwall farm. – the ability to keep nutrient on farm by running effluent through the system. The upgrade to the pivot dramatically reduced the labour input required. The pivot is automated, so it is possible to turn it on and off via a computer or mobile phone, so Alex does not need to be on farm to start irrigating. The number of hours the pivot runs per season is 1,297 hours, but most of these hours require no labour input from staff. 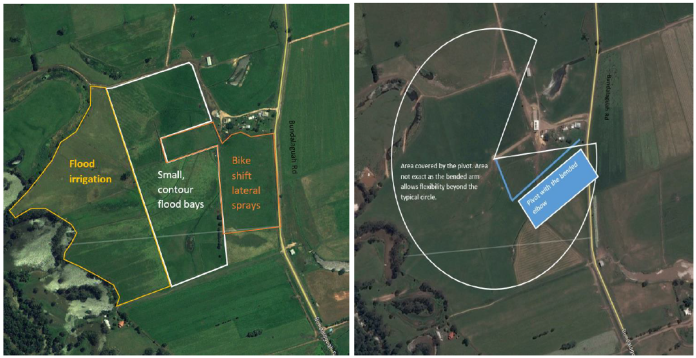 The area under the pivot has also been fenced to assist with stock movement and pasture management, further reducing the amount of labour required for the area. Savings are also being gained by operating the pivot on off-peak power, reducing the cost of operation. The high areas across the farm that were ineffectively flood irrigated, and the low areas that were water-logged, are now irrigated uniformly by the pivot. The pivot can apply smaller amounts of water much more frequently than flood irrigation, leading to optimum soil moisture levels and maximized growth of pasture. 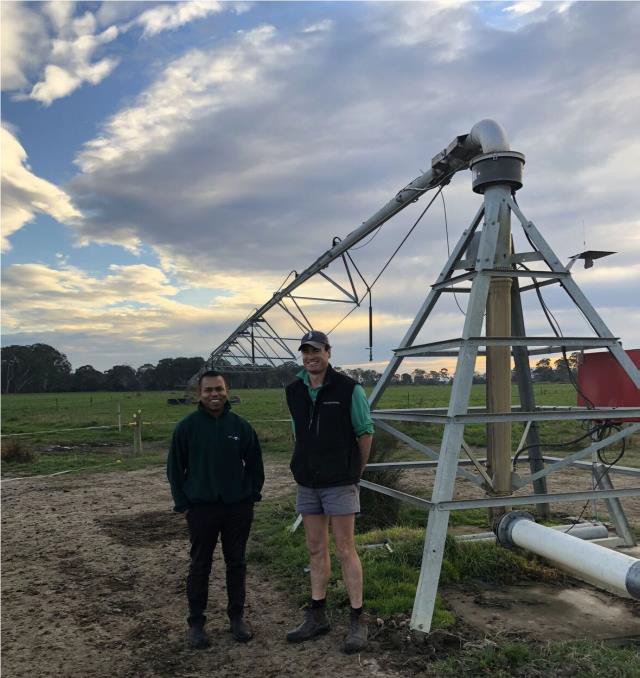 The pivot applies on average about 15 mm per hectare per irrigation, with Alex able to vary this amount between 9 and 20 mm, depending on pasture water demand. The flexibility of the storage dam allows for the pivot to be operated at any time of the year. The ability to irrigate throughout the winter as required to boost production and ensure a feed wedge coming into the Spring was a great bonus with the pivot. Since purchasing the farm, the pasture production has been measured and has seen dry matter production of 12-13 TDM/ha annually. The pastures across the area remain as unimproved older perennial stands which are performing very well under the new irrigation system. With extensive drainage works completed the weed burden has significantly reduced, increasing favourable species across the area and improving the soil structure. The dairy effluent is being used through the pivot and spread evenly and regularly across a large area, limiting run off, reducing fertiliser use and keeping more nutrients on farm. The fertility of the pasture has also been improved, with the nutrients in the soil increasing significantly into the optimum range. The ability to dry walk the pivot has been a major benefit as there is no double up on the amount of water being applied to the same area twice in a row. From a lifestyle perspective the ability to turn the pivot on remotely has helped staff to irrigate effectively. Drainage is key to good pasture production and it needs to be a priority when developing a new project. Efficiency gains have come from the ability to irrigate overnight as required and reduction in actual labour required. There is no point having an end gun on a pivot unless it has a booster to more evenly distribute the water, as before the booster was put on there were areas that were missed. Do it properly to start with and it will save a lot of headaches. The right rate, at the right time, with the right machine, otherwise you miss too many opportunities to grow the grass. Through the utilisation of the pivot, the pasture production on farm and stock management and grazing efficiency have improved significantly. Stocking rate has tripled, and labour time has decreased. The saving of labour with the pivot has enabled the remaining irrigation systems on the farm to be used more efficiently, further boosting pasture production. From a lifestyle perspective the pivot can be managed from afar making it easy for staff and managers to correctly schedule irrigations through the summer period.